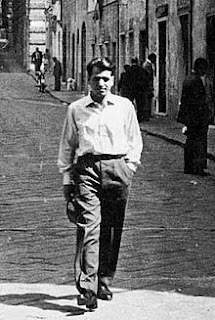 Giuseppe 'Pino' Pinelli, the railway worker from Milan who inspired Dario Fo to write his classic play, Accidental Death of an Anarchist, was born on this day in 1928. Pinelli fell to his death from a fourth floor window of the Milan Questura - the main police station - on December 15, 1969, three days after a bomb exploded at a bank in Piazza Fontana in Milan, killing 17 people and wounding 88. A known anarchist during a period of growing political and social tension in Italy, Pinelli had been picked up for questioning, along with a number of other activists, over the Piazza Fontana bomb. The story put out first by police was that Pinelli had jumped, willing to take his own life rather than face prosecution. Yet three police officers who had been interrogating Pinelli were put under investigation. No action was taken against them and later a judge ruled that Pinelli's death had been accidental. This time the suggestion was that he had fainted, lost his balance and fallen through the open window, which seemed to many to be somewhat far-fetched. It did not convince his supporters and when one of his interrogators, Commissioner Luigi Calabresi, was shot dead on his way to work in May 1972, two left-wing activists were convicted of his murder. Pinelli was posthumously cleared of playing any part in the bombing, which was blamed on far-right extremists. Born in the then working class area of Porta Ticinese, Pinelli left school early to supplement the family income, taking jobs as a waiter and a warehouseman. The opportunity to take a more secure job as a railwayman did not come along until his mid-20s. He was married soon after joining the railway and fathered two children. 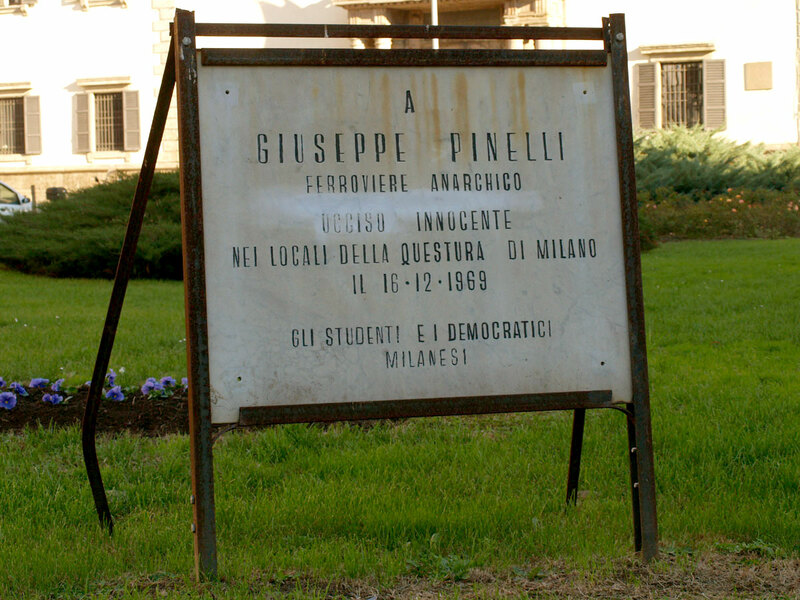 Already politically active with anti-Fascist groups, Pinelli became increasingly interested in libertarianism, a philosophy that favours minimal state intervention in the lives of citizens, and in anarchism, whose proponents believe in the abolition of all government and the organisation of society by voluntary co-operation. 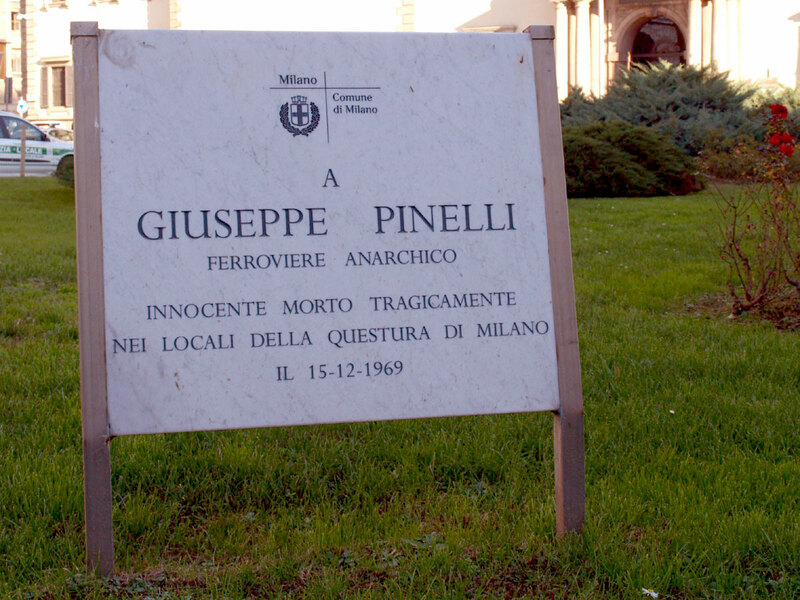 Pinelli was a member of a group that eventually evolved into the Ponte della Ghisolfa Anarchist Club, named after a railway viaduct visible from the Porta Garibaldi station, where Pinelli worked. After the student unrest in France in 1968, such groups saw their memberships swell as young Italians also began to challenge authority and the state. That period was also the beginning of the so-called Years of Lead in Italy, when social and political tension was frequently punctuated by acts of terrorism, of which the Piazza Fontana bombing, the target of which was the Banca Nazionale dell'Agricoltura, was the first major incident involving civilian deaths. 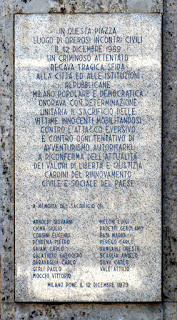 Over the next decade or so, organisations at both extremes of the political spectrum, from the Brigate Rosse (Red Brigades) on the left to the far-right Ordine Nuovo (New Order), were responsible for bombings and assassinations, including the kidnap and murder of former prime minister Aldo Moro and the bombing of Bologna railway station. The situation was complicated by the existence, admitted only later, of the CIA-sponsored Operation Gladio, a secret network that aimed to manipulate events in a way designed to diminish support for Italy's Communist Party. The Piazza Fontana incident, which was later established as the work of Ordine Nuovo, was initially blamed on left-wing extremists and sparked a crackdown on such groups, although Pinelli was unaware of this when police turned up at his door within just a few hours of the explosion. He was used to dealing with the police, although it was usually over matters such as licensing of premises and permission to stage public gatherings. Luigi Calabresi, at it happened, was the officer he dealt with most, and there was no evidence of serious friction between them. Pinelli did not need to be arrested, voluntarily following the patrol car to the police station on his motorbike. What he did not expect was to find the station packed with other activists rounded up in a general sweep and to be detained for well over the 48 hours permitted, and subjected to intense questioning. He certainly did not foresee that he would never return home. 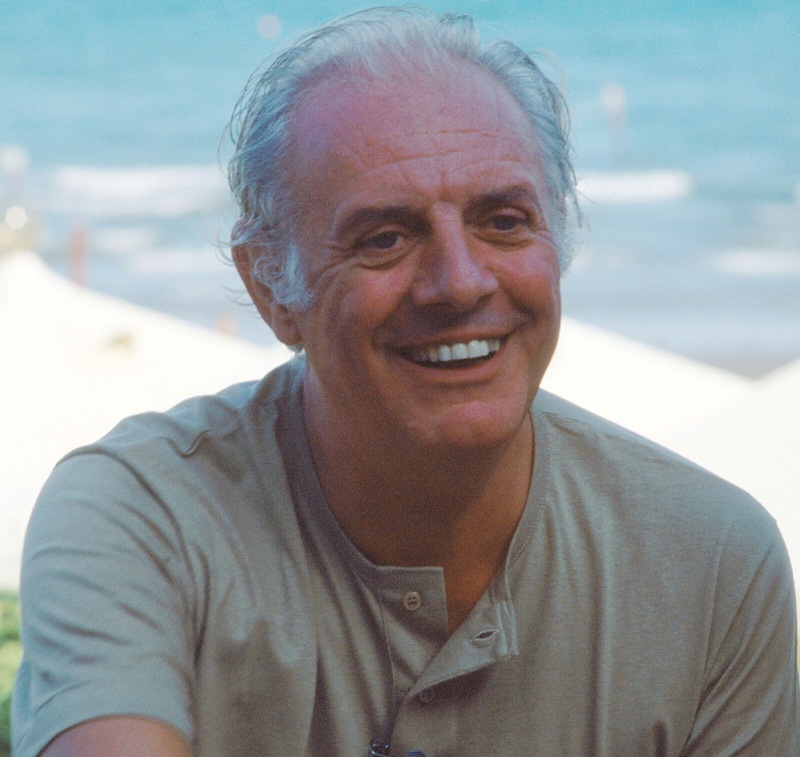 Dario Fo, a playwright, actor and comic entertainer with a reputation for acidic satire, wrote Accidental Death of an Anarchist within a year of Pinelli's fatal fall. In the play, which he presents as a farce, Fo sends up the police as slow and dim-witted, tricked by a fast-talking fraudster known as The Maniac, who employs a series of impersonations to confuse the officers, into contradicting themselves and revealing that there has been a cover-up involving the death of an anarchist. Still performed today, it is the best known of all Fo's 80-plus plays, certainly outside Italy. It has been performed in more than 40 countries. Fo, who received the Nobel Prize for literature in 1997, died earlier this month, aged 90. The area of Milan called Porta Ticinese draws its name from one of the gates in the medieval walls of the city, from which a road led to the Ticino river, which loops around the city to the south and west. It was rebuilt twice, by the Spanish in the 16th century, and in the 19th century along the current neo-classical lines, comprising massive pillars and columns topped with a triangular decorative tympanum. 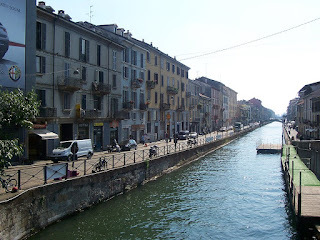 The area is part of the Navigli district, once a poor neighbourhood but now very popular for the restaurants and bars that line what remains of Milan's canal system. Piazza Fontana is located a short distance from Milan's Duomo, accessible along Via Carlo Maria Martini, behind the cathedral to the right. 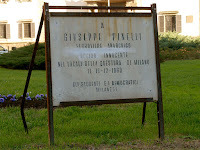 As well as a plaque on the wall of the Banca Nazionale dell'Agricoltura, commemorating the 17 people killed when the bomb exploded inside their building, there are two simple memorials to Giuseppe Pinelli on an area of grass opposite the bank, one erected by the city council, which refers to Pinelli's 'tragic death', the other by friends of Pinelli, who use the word 'killed' in their inscription.